The Milan Earth Market opened for the first time on Saturday December 12, 2009, in Largo Marinai d’Italia (Zone 4). It was the second Slow Food market in Italy to be held in a major city, following the success of Bologna. In May 2012 our market moved to the Fabbrica del Vapore, via Procaccini 4 (Zone 8). The main market producers are from the South Milan Agricultural Park which at over 47,000 hectares is one of the largest urban-edge agricultural parks in Europe. The wider catchment area for the market lies within the three rivers demarcating the city (the Ticino, Adda and Po) and the lakes of Brianza and Varese. The market’s initiatives include Taste Workshop tastings organized by the Slow Food Lombardy convivium to enable visitors to compare outstanding products present at the market with ones of lesser quality. Another fundamental activity was the ‘Ideas sharing stall’ animated by a group of design researchers of Politecnico di Milano, that occurred from the beginning of the initiative until 2014. It consisted of a set of co-design initiatives taking place within a stall space: the idea was to have a physical space in which to make contact with the potential users of the services to be developed, co-creating, prototyping and testing food services before their real implementation. The Milan Earth Market project is organized through a co-funding arrangement following a protocol of understanding between Slow Food Italy and South Milan Agricultural Park. The Milan local authority and the Cariplo Foundation are key sponsors of the initiative, as part of the “Feeding Milan project – Energy for change”, a research program promoted by a partnership between academic institutions, such as Politecnico di Milano, Department of Design and University of Gastronomic Sciences, and Slow Food Italy, with its network of local players in the Milanese area. The key-players of the market are about 40 producers with an extraordinary range of products, including some Slow Food Presidia. They come essentially from the South Milan Agricultural Park, but there are also some “producers guests” coming from different areas. The main beneficiaries of the initiatives are both producers and citizens: the first ones have the opportunity to sell their products directly to clients, according to the principles of disintermediation, while citizens can have access to high quality food at affordable prices. Among the main actors there are also researchers from Politecnico di Milano, who animated the market activities with their “Ideas Sharing Stall”, a sort of window where the reference communities of producer and citizens, jointly with potential stakeholders in the public and private sectors, get to know the possible services to be implemented in the city, in a sort of fast co-design session. The role of design in the Earth Markey is essentially explicit. The market is part of a research project in which also designers participate and they use their capabilities in several ways, relating to different design areas: interior design, service design, communication design, participatory design. The result is the design of a new public space, in which the conviviality created by combining food, activism and entertainment is the crucial feature. More specifically, service design is one of the areas more represented, together with participatory design: the “Ideas Sharing Stall” was precisely conceived to include citizens in the co-design of new short-chain food services and to understand their needs and desires. 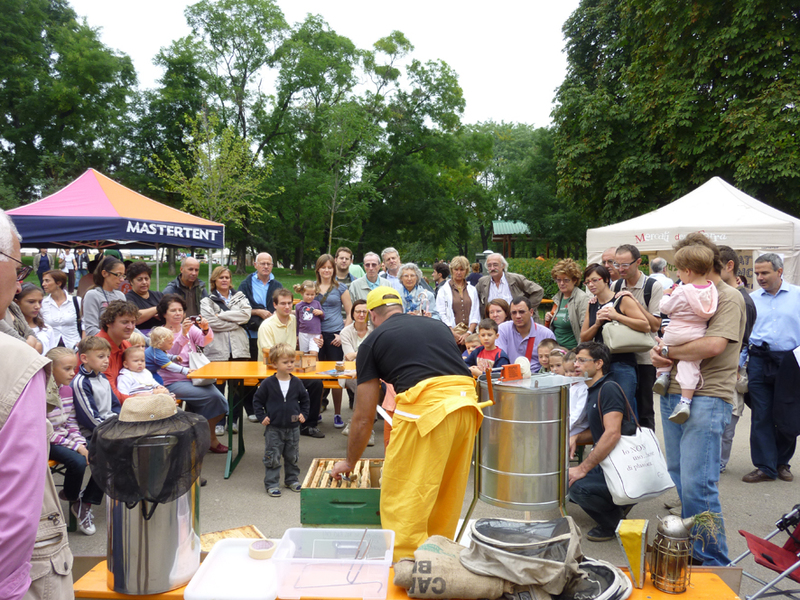 Thanks to these activities several services were tested, among them the “Farmers’ food box”, the “Local Distribution System” and “Yes week-end”, this last one related to a zero-mile tourism system in the South Milan Agricultural Park. In a way, also the “interior design” of the market was especially conceived to generate convivial situations, the layout of the market is “inclusive” with tables and benches available for everybody, for organizing lunches, tasting products and socializing. Communication design is evident in all the advertising materials, both physical and digital, in the signage and corporate identity of the market, in addition also producers create a great variety of communication materials that enrich the “global storytelling” of the Earth Market.